Former Trump campaign director Michael Caputo said Sunday he thinks the anonymous op-ed writer is a woman who thinks "she should be the president instead of Donald Trump." WHITFIELD: All right, joining me right now, former Trump campaign Director, Michael Caputo. So Michael, good to see you. Do you think the White House is giving credibility to the writer by these high level officials coming out and saying it's not me? 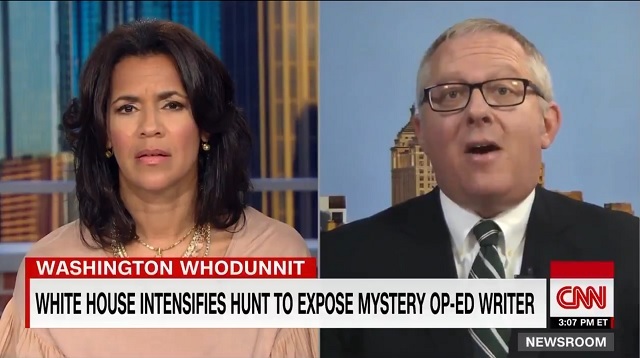 MICHAEL CAPUTO, FORMER TRUMP CAMPAIGN DIRECTOR: Well, I think each one of those people has to do that. And the media, the New York Times in particular set that up. And the writer -- I believe the writer is a coward. But also, I believe they're diabolical. I mean, the way they wrote that op-ed, or the ghost writer wrote the op-ed, they dropped in words like load star to indicate that it might be Mike Pence. And words like first principles, very common to the speeches that General Mattis gives to throw some shade at him and then they dropped in that off the rails comment that comes from the Woodward book that's attributed to General Kelly. And that's, to me, gaslighting the President which is very diabolical. Into believing it's one of his key agents. It's really, you know, plotting against him. WHITFIELD: But if it's insignificant, why is it the White House keeps talking about it, keeps throwing out its top level folks to say or comment about it. It wasn't me. I don't know anything about this. It's a terrible thing. But they keep bringing it up which only gives this writer more power. Does it not? CAPUTO: I'll tell you. I'm not one of the ones who believes this is insignificant. I have been screaming from the top of my lungs for several weeks now that we're going to lose the House of Representatives, Democrats are going to take over and that they're going to impeach the President in the first quarter of 2019. This op- ed to me is part of that strategy. This person who I believe is in the senior ranks of the administration wrote this in order to try and dampen turn out of the deplorables who would normally go out and droves to vote for the President's candidates. The Republican candidates for Congress in particular so we can maintain control of the House. Let me tell you, Fredricka. I'm fairly certain I know who it is. I have been, you know, going through these parlor games just like everybody else has. And I'm also completely 100 percent certain that the person who wrote this is on the list of people who said they didn't write it. WHITFIELD: All right. So, who do you think it is? WHITFIELD: So you talked to your attorney, you've consulted your attorney, you've said I think I know who this is based on certain language that was use and you've consulted your attorney and your attorney says don't reveal it? CAPUTO: Right. I mean, based on language, based on the fact that I believe these kinds of people leave a trail of crumbs when they are trying to deceive people around them. That's the way it always is. The President looks at the key departments of this government that has been purged of all Trump supporters. That's a good place to start. And that actually exists. Trump supporters have been purged from this government now for 18 months. Last week I spent the evening with several friends of mine from the Trump campaign, all of them have been forced out of the administration. So from my perspective, what's even more important here is to -- you know, it's not the parlor game. What is the author's connection to other people? You know, we've all talked about -- you know, there are people in the White House now telling the President don't worry about the House? You can campaign against a Democrat House and win re-election in 2020. There actually people telling the President don't worry about impeachment. WHITFIELD: As you dissect that op-ed since you do feel like you know who it is, is it the language? Is it something about certain details about the parameters of the criticism that allows you to place that person? Do you place them in the White House? Do you place them in a particular department or division? WHITFIELD: Do you believe it's someone who has taken an oath? CAPUTO: I believe so. And, in fact -- I mean, if I can just continue my thought, you know, we -- you know, the White House political office and others have kind of shrugged about the idea of losing the House and maybe being impeached because the Senate won't do anything about. They won't convict the President on the charges of impeachment. But I think when we find out who this person is and the President's team should find out, we're going to find out this person has real deep and abiding ties to Congress and this op-ed is one step closer not just to impeachment but conviction. [15:10:04] WHITFIELD: So do you feel like you've figured it out who the person is? Do you believe the White House has figured it out? WHITFIELD: Well how come you know and they don't? CAPUTO: Well, I believe they are getting there. I have my opinions. You know, I started with this. Who is the person who I believe hates the President the most? Who is the person in the administration who has screamed about him in their own private office and gone forward and purged their entire office of Trump people? That's what I'm looking at. The language of the op-ed I think is useless to look at because it's a ghost writer. If we did like we -- Remember when primary colors came out and they actually compared the writing through a software program and discovered that it was Klein (ph) wrote that book. I believe that would be useless in this regard because ghost writers write for dozens and dozens of people. It's not going to get us any closer. We'll be able to identify the ghost writer, but then we'd have to get the ghost writer tell us who this person is. WHITFIELD: All right. Are you thinking it's a matter of days, weeks, or months? CAPUTO: -- the president instead of Donald Trump. And in my mind I believe that the President should move forward with a team of people to discover who this is. But the President himself should focus on the mid-terms. Because -- We are going down a rabbit hole, you know, by gaslighting the President into believing his closest aides with those clever words dropping this op-ed are plotting against him. They're sending him down a rabbit hole instead of off onto the hustings where he should be campaigning for Republican candidates so that we keep the House and embolden the Senate in support of the President's policies. If he focuses on this instead of the campaign trail, we are in real trouble. 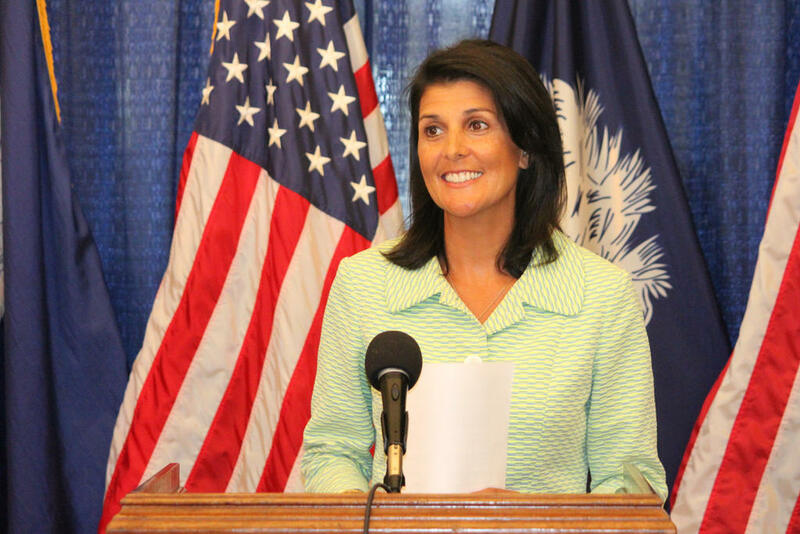 Sounds like Nikki Haley. She's done everything in her power to undermine Trump and get us ensnared into another war with Syria. She also just wrote an op-ed denying being the writer in The Washington Post.